A vasectomy is an extremely effective form of birth control that blocks the passage of sperm from the testicles, making a man infertile. A vasectomy is a simple procedure that is done in the office with local anesthesia. The procedure usually takes less than 30 minutes to complete and can be done without a scalpel- the No-Scalpel Vasectomy. If you are certain that you wish to have a vasectomy, Dr. Labasky is able to perform the pre- vasectomy consultation and the vasectomy at the same office visit. At that visit, Dr. Labasky will review your medical history, examine you to be sure the procedure can be performed safely, describe what to expect during the procedure, and answer your questions. If you feel comfortable proceeding, Dr. Labasky will then perform the vasectomy. Your partner is very welcome to attend the consultation and observe the vasectomy. 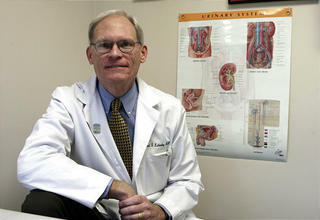 To schedule your vasectomy, call Dr. Labasky's Sandy office at 801-501-5300. Gain a better understanding of what to expect at our office by viewing previous patient reviews on our testimonials page.